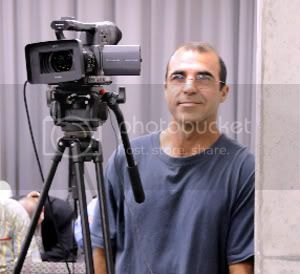 The driving force behind Global Voices for Justice (GVFJ), Mansoor Sabbagh works tirelessly, driving – or taking the Metro – all over Southern California to film panels and speakers on critical and compelling issues affecting our lives today. Many GVFJ programs have been aired or offered as premiums on public radio stations. These programs and many more are available direct from GVFJ for donations of $5 or more. We depend on your support to allow us to make these important voices available to everyone. Donations – Please make donations via check or money order payable to “ASD” (our fiscal sponsor, Activist San Diego) and mail to: Global Voices for Justice, 1535 Termino Ave Unit E1, Long Beach CA 90804. Or to donate by credit card, please call Mansoor at 310-283-0885. CD and DVD Premiums – Every donation allows you to choose from a collection of insightful and compelling talks. Supporter: Donate $10 per month, OR make a one-time $120 contribution, OR donate $120 in equipment from our Wish List, and receive one DVD or video download per month for one full year. Guardian: Donate $50 per month, OR make a one-time $600 contribution, OR donate $600 in equipment from our Wish List, and receive one DVD plus two audio CDs (or downloads) per month for one full year. Benefactor: Donate $100 per month, OR make a one-time $1,200 contribution, OR donate $1,200 in equipment from our Wish List, and receive one DVD plus two audio CDs (or downloads) per month for one full year along with thanks in our DVD and audio program credits. Patron: Donate $200+ per month, OR make a one time $2,400 or more contribution, OR donate $2,400 or more in equipment from our Wish List, and receive one DVD plus two audio CDs (or downloads) per month for one full year along with special acknowledgement in our DVD and audio program credits and an open invitation for dinner at our headquarters in Long Beach, California. Please contact us about volunteering or donating equipment. Very neilcy shot – On my computer it looks like Brightcove pixelated it a lot… but you can tell that it probably looks very nice natively. I like that the background is different then the normal VOICE episode. There was one point around 1:30 where it seeemed brighter than the rest of the piece. Did you change the lighting or something?Side note: What’s the Education Arcade? That sounds like fun…Nicely Done! You posted your comment under our donate page, so I don’t know which video you’re referring to with your comments – but thanks for checking in! At any rate, I love what you have done so well for so many years and would be honored to donate a small amount to the cause of “global justice”. Mail it in? That would be awesome. We recently lost our non-profit status when our fiscal sponsor, International Humanities Center, disappeared (see LA Times story) along with almost 50% of our donations from 2011. Many other organizations were hurt much worse than we were, but it has been devastating nonetheless. Until we find another sponsor, please make donations payable to Mansoor Sabbagh. Thank you!! Point taken about smaller donation categories – adjustments made! Thx for the information, and your blog definitely looks amazing. Just what word press design are you utilizing?